“What are you sorry for?” Mhumhi asked Kutta. She took a moment to respond, lowering her eyes to the rain-soaked ground. Her hind legs were still submerged in the water, and the pouring rain had plastered her ears and fur against her body. Mhumhi suddenly realized that it had been the longest he’d ever been without her. No- aside from when he had been captured by the bouda, he had never been away from her side for more than a few hours his entire life. How many days had it been…? “Everything,” said Kutta. He was brought back to the present. “I thought maybe the gray pack was forcing you to stay here,” said Mhumhi. “I don’t know,” Mhumhi admitted. Mhumhi’s tail drooped, and he brushed his forehead against her shoulder. Kutta’s chest expanded as she took a deep breath, then let it go with a shudder. “No,” said Mhumhi, shaking his head. Rainwater sprayed. The sky flickered with bright lightning, and they both flinched. “Do you want to find somewhere to get some shelter?” said Kutta, eyeing the gray sky. “Yes-” Mhumhi flinched again as an explosive clap of thunder rang out. The water in the pool beside them shuddered. Mhumhi found himself suddenly transfixed by it. “What’s the matter?” asked Kutta, shaking a dripping paw. “She won’t hurt him!” snapped Mhumhi, increasing his pace. Mhumhi kept moving, pulling his ears tight back against his skull, paws slipping and splashing in scummy water with swirling pieces of trash. Kutta sprang in front of him. “Just like you did?” Mhumhi said, and then looked away. Kutta gave a weak, wet snarl. Kutta seemed shocked, her eyes wide, bright yellow in the dull rain. She didn’t say anything else until Mhumhi started to step around her. His chest tightened, and he gave her a furious, mordant look, and then started running again. She called him once. But he flattened his ears and ran faster, sprinting. The dirt floor of the den would be filling up with water. He ran over hills, splashed through flooded valleys, and from time to time had to struggle through deep water. The storm raged, lighting everything in sharp relief with every flash of lightning. Every bit of garbage, every detail illuminated. He turned around and froze up as something massive and gray bulled its way towards him, its eyes lighting green in the next flash of lightning, white teeth shining in its open jaw. But when the light faded, Mhumhi let out a breath. It was only Vimbo. As the thunder growled above them the hyena’s lope slowed and he approached Mhumhi with his tail curling from side to side. Mhumhi looked around behind him, but there was no sign of Kutta. “You’d better stay back when we get to the den,” he warned Vimbo, though of course the hyena would not understand. Still, in his own way, he was a comfort. Mhumhi’s heart felt a little bit broken. His fears were more than realized when he finally came within sight of the tire stacks and heard Hlolwa’s hoo-bark, muffled by the rain. There was desperation in her call. “Stay, Vimbo,” he said, sprinting forward. He could see Hlolwa’s dim shape standing atop a stack. The water swirled around his paws. “There’s one missing!” she shouted down to him, as soon as he was within earshot. “What?” called Mhumhi, as the sky snarled again. “She might have gotten swept away!” Hlolwa shouted. In the circle of the tire beside her Mhumhi saw one, two, three, four tiny shivering bodies. Hlolwa’s eyes were wide and helpless. Mhumhi turned and nearly ran into Vimbo, looming out of the rain like a behemoth. He grunted, blinking the water out of his eyes. “Help me look,” Mhumhi said to him, uselessly. He glanced back to the tire stacks- Hlolwa was licking her remaining puppies. Either she hadn’t noticed Vimbo or she simply didn’t care right now. He also noticed, with a jolt, that Tareq was lying next to them, on a stack a little lower to the ground, just barely keeping his bad leg up out of the water. His face was dark and strained. Mhumhi searched. He searched all around the tire stacks, Vimbo following him, checking everywhere on the ground, every corner the little puppy might have been swept against or crawled into. The rain was starting to lessen by the time Hlolwa called him again, from up on top of the stacks. “It’s all right,” she told him. Mhumhi opened his mouth, then shut it again. He became aware that he, himself, was shivering, the water soaking his skin, his fur sodden. Tareq was crying. Mhumhi slowly climbed up next to him and licked his face. His tears were salty. He tried to say something, but most of the words came out in choking sobs. “No,” said Tareq, in kind of a moan, and put his head in his hands. Mhumhi leaned against him. His last words had been a whisper, barely audible, but Mhumhi went tense. Mhumhi jumped down from the tires with a mighty splash. Vimbo, who had stayed below, squealed and splashed in return. Mhumhi ignored him, as well as Hlolwa’s startled words. He ran to the alcove. He had looked there, but on the ground- and it was flooded, up to his chest, where the dirt was hollowed out. Had Tareq managed to drag himself all the way outside? Mhumhi shook off the thought for a moment, and reared up onto his hind legs, turning his ears. In the lessening rain, he was just able to make out a tiny whimper. It was coming from one of the tires, wedged into a stack so that the others overlapped above and below it, making a sort of ceiling and floor. Just a tiny gap allowed access from above, the right size for a small hulker’s hand. Mhumhi thrust his nose in and recoiled; aside from the warm, milky smell of puppy, it smelled like rotting meat. He had a problem. He could thrust his snout in as far as it would go, but it did not penetrate the full space, and it was so tight he couldn’t open his jaws. The tip of his nose brushed something soft, and it moved away. 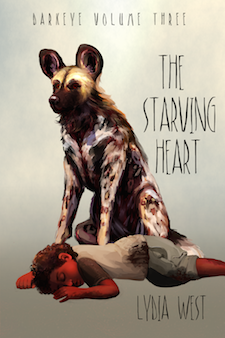 Mhumhi gave a whine, scratching at the tires, struggling, but he could not reach the puppy. Of course the puppy did not come out. He heard it whimper again. He put his nose back into the hole, scraping his lips back, and was abruptly jarred. He jerked out; Vimbo had headbutted his side. Vimbo shouldered him aside and sniffed at the opening. Mhumhi couldn’t help but feel tense. Vimbo had not reacted well to the sight of Bii in the past; how would he be towards a tiny puppy? He became more frightened when Vimbo suddenly lunged and buried his teeth in the tire. The stack above him trembled. Mhumhi ran forward, but Vimbo gave a grunt and a fierce yank, his teeth slicing through the thick black rubber, tearing it, pulling it back, and suddenly Mhumhi could see the puppy, crouched and shaking at the very back of the tire. He lunged forward and grabbed it. It gave a little squeal, kicking, for his grip was not ideal, but it was alive, it was all right, it was going to be fine, it was… it was the puppy with the floppy ears. Mhumhi wanted to laugh, but he had the puppy in his mouth. They splashed back to Hlolwa. The rain was still stubbornly continuing, if not with the ferocity it had had before, and the puppy was getting soaked. Her whimpers increased in volume. When they swung around the den, Mhumhi saw Hlolwa jolt to her feet on top of the tires. She didn’t say anything when Mhumhi reared up to give her the puppy, just took her daughter from him and put it with the others. Mhumhi turned and caught Tareq’s eye; the boy was shaking, his face puffy. That was Hlolwa. Her eyes seemed vague and misty, staring at the air over Mhumhi’s head. “Vimbo helped me,” said Mhumhi, indicating the hyena behind him with a jerk of his head. Hlolwa’s eyes finally refocused, and she looked at Vimbo, who was sitting and licking his forepaw. Mhumhi went around and laid down on the tires next to Tareq, a very uncomfortable seat, but it felt better when Tareq put his arms around his neck and cried into his wet fur. Eventually, the sun came back out.